Daisy was born in the Midlands and moved to West Yorkshire during her early childhood, before relocating to Newcastle to complete her Bachelor of Arts Degree in 2012. Following University, Daisy moved to the Balearic Islands working in a VIP beach club in Ibiza. This kickstarted her love for working within the tourism sector. From Ibiza she moved to Australia, and has since visited Indonesia, Sri Lanka, Thailand, Dubai and more. Most recently, Daisy spent two winters working in Val d’Isere, a 6*ski resort in the French Alps, where she put her extensive experience in international customer service to use. 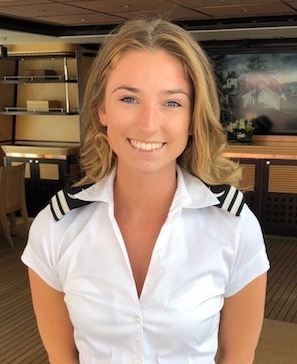 Daisy is excited to gain invaluable experience from her time on M/Y Harle. After having helped out on board in the past, Daisy is over the moon to be returning as a full-time crew member. Harle | Copyright © 2016 - All Rights Reserved.